1. 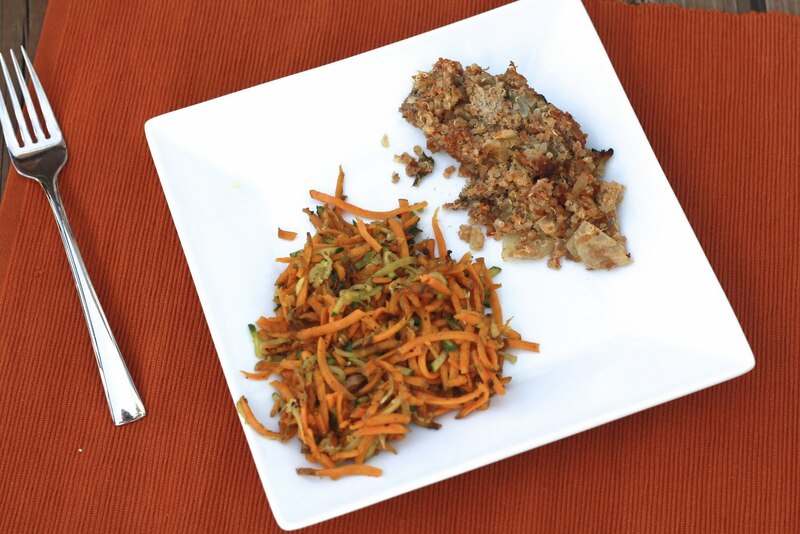 This is a rather orange looking meal (that is shredded and sauteed sweet potato/zucchini, heavy on the sweet potato, beside the zucchini). 2. Meatloaf doesn't photograph well. There's no way around it. Sometimes the best tasting foods aren't exactly the prettiest. Not everything we put in our mouths can be as beautiful as cinnamon rolls or grilled pizza. Don't let that deter you though...Ryan and I were both pleasantly surprised by how much we loved this dish. Most meatloaf has the reputation for being solid, bland, and ugly. While this one might still be ugly, it's falling apart it's so moist and it's anything but bland! I wasn't sure how this would taste, but the jalapeno, cumin, and basil all did their part in spicing up the dish. 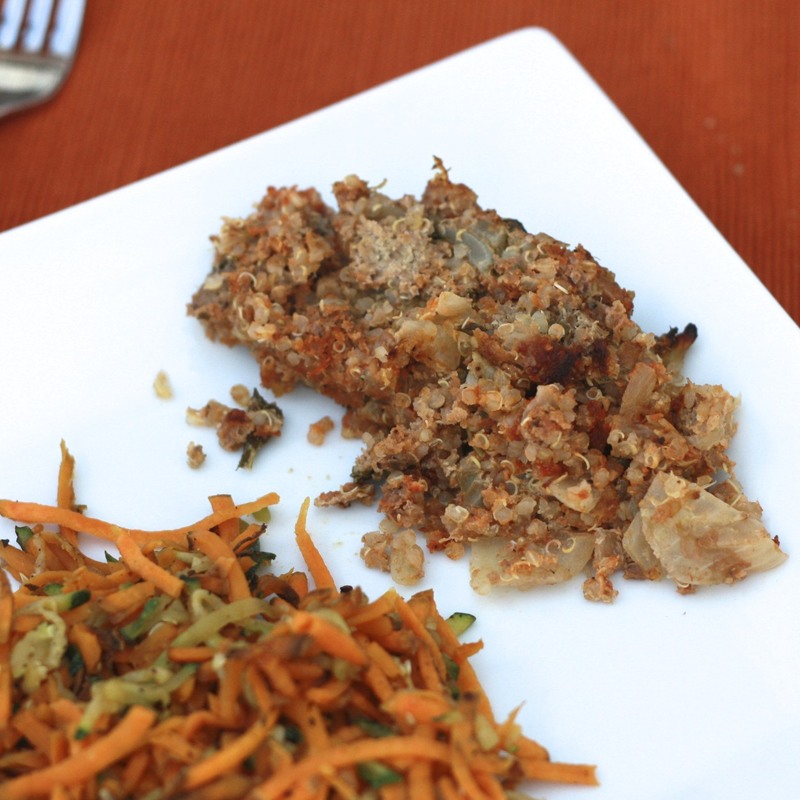 The secret ingredient in this meatloaf, or not so secret if you read the title, is the quinoa. Recently, Swanson Health Products gave me the chance to review some items for the blog. I was like a kid in a candy store, or in this case, a kid in a health food store ;) Though it took me awhile to choose, I ultimately decided on whole wheat pastry flour, clover honey, organic coconut oil, garbanzo bean flour, and the organic quinoa I used in this. So far I've been incredibly impressed with Swanson Health Products...not only did I find the prices reasonable (despite the fact that these were given at no cost, I would definitely pay these prices on my own dime! ), but I was thoroughly impressed with their customer service. My box of goodies arrived in a bit of turmoil--the flour had exploded and the liquid products were leaking a bit. All it took was a 5 minute phone call with an incredibly friendly and helpful employee before I had replacements on their way. I LOVE good customer service! The quinoa was a great addition to this meatloaf. It gave the dish that extra moisture I mentioned and an extra dose of protein! This took minimal prep work and resulted in a healthy, hearty meal...exactly what we're going for in The Sweets Life kitchen! Two thumbs up to Swanson Health Products for great service and great products! I've already been using the whole wheat pastry flour in a few quick bread recipes and I have grand plans for some of the others! 1. Preheat oven to 375F. Coat a 9-inch loaf pan with cooking spray and set aside. 2. In a pan over medium heat, add olive oil. Add onion and jalapeno and cook, stirring frequently, until onion is softened (3-4 minutes). Stir in cumin and cook for 1 more minute. Remove from heat. 3. In a large mixing bowl, combine the onion mixture with the remaining ingredients. Mix thoroughly until well combined and transfer to the loaf pan. Bake for one hour. Turn the oven off and allow the meatloaf to sit in it for 10 minutes. Remove from oven, cool for 5 minutes, and slice.